In the Netherlands we have a debate going on on the pricing in parking garages. Normally prices are by the hour of half-hour. That means that if you come back after 62 minutes you pay for 2 hours. A retail trade platform is even complaining about lower revenues because of this injustice. Slightly off-topic, but I’d be interested in your thoughts on the following way of circumventing what might broadly be linked to architectures of control. A few years ago, I was living in Finland at a time when the Helsinki tram authority was also attempting to introduce changeless ticketting (timed, if I remember correctly to coincide with the introduction of the euro). In this instance, enforceability of ticket purchasing was slightly attenuated by the ease with which passengers can board a tram without paying, since ticket machines are external (in shops and at stops) and there are relatively few conductors. In response to perceived price-hikes, disgruntled commuters set up the Helsinki Freeriders Association. At a modest â‚¬30/year, subscription entitled you to full reimbursement of the fines for not having a ticket. I suspect the council found a way to curb it eventually, but the scheme was hugely successful in the short-term! That’s a very interesting way of ‘insuring’ oneself against something fairly unlikely (getting caught) – I wonder in what other contexts something like that could work? Presumably the tram authority was still able to operate the trams viably even with a significant proportion of travellers not paying, otherwise enforcement would have been rapidly improved. So, overall, the system ‘balanced’. Does anyone have any more information or other examples of this kind of thing working? @Joost: Thanks for the comment – I suppose parking prices (and hassle) are probably a factor in drop-off in trade in city centres compared with the free parking at large out-of-town superstores. There seems little reason (other than encouraging overpayment) for not offering smaller time increments. Thinking further, the very nature of being required to estimate how long you will need to park for, and paying, beforehand, rather than when exiting the car park, could be construed as encouraging overpayment. I think most people end up paying more when guessing how long they’ll be – you pay for longer than you need ‘just in case’ – whereas a system where you pay on exit at least allows more accurate assessment. Filesharing insurance, perchance? Pay a few dollars a month; if the RIAA ever sends you one of those “pay us $3000 now, or face the wrath of our lawyers” notices they will furnish the $3000 to make the RIAA go away. 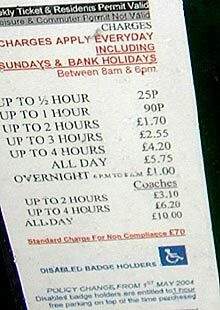 I used to go shopping in a town called Mold in Wales, where the car parking was 0.20p for two hours, quite possibly the cheapest parking in the UK. What often happened was I would only spend about 1/2 hour going to the bank then return to the car park with an hour and a half still on the ticket, so as I left the car park I would hand my ticket on to someone just coming in. This was quite frequently the case with other users as well. About 18 months ago the council there changed the machines to issue tickets with the car registration details on them, hence removing peoples ability to transfer their unused time to someone else. They never increased the tarrif though, so its still really cheap to park there, but obviously now they have increased their revenue as everyone has to buy a ticket. Off on a tangent a little here, but last time we went to the cinema we used a pay & display car park, and noticed that the drain grille that ran along the length of the parking slots terminated just under the machine, somewhat clumsily extending itself past a kerb edge in order to do so. If you dropped a coin I’d say there’d be a 50% chance it’d go through that grille, which prompted some paranoid speculation about the council using the drain to implement a ‘clumsy tax’. Though with our council some kind of “if it falls on the floor it’s legally ours” law would be more likely, with coin attendants ready to pounce. 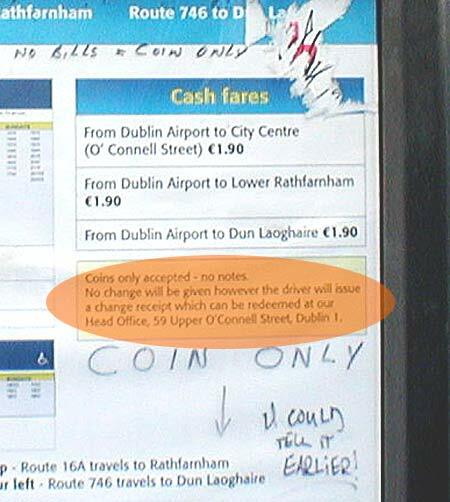 Three-way collusion between the retailers, the bank, and the transport authority? Magnus’s ATM vs ticket machine problem described here is not unique. 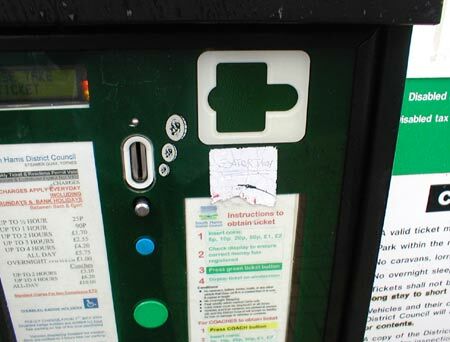 In Guildford, the nearest municipal car park to the railway station – pay on foot at the machine before exiting – accepts notes, but only Â£10 denomination. 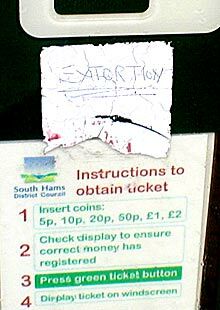 On the station there’s an ATM which is really useful if you’re arriving by train with no cash and need to get your car out of the car park – except it only issues Â£20 notes. You can always go and buy something in the station newsagent to break your Â£20 note – but only after you’ve walked to the car park and discovered that the machine won’t accept the notes you have just withdrawn from the ATM!